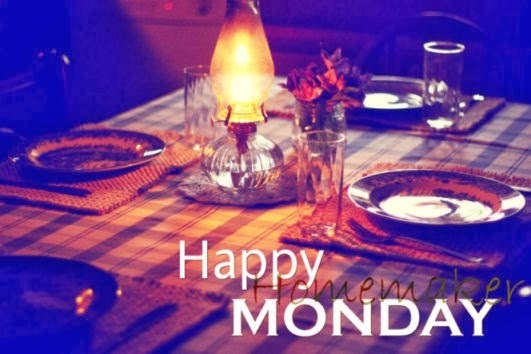 Happy Homemaker Monday to one and all! It was a beautiful sunshiny day here earlier but looks like the clouds are rolling in and the wind is starting to blow...just a little! The weekend was short because of traveling home from Boise on Saturday but I rested most of the day yesterday (minus a few loads of laundry) so am ready to get with the program today! Now, what was the program again??? Our host each week for Happy Homemaker Monday is Sandra at Diary of a Stay at Home Mom. It looks like she is Spring Cleaning this week!!! My Spring Cleaning will have to wait till I get home from my trip. I am drinking my Zip Fizz with lots of ice (of course). My mind is consumed with getting ready for my road trip with DD and DGD! Unfortunately it is also working overtime creating scenarios that may or may not happen. I need to just relax and trust that all will be well. Tuesday nights I have been enjoying About a Boy and Growing Up Fisher on NBC. I think I have to wait another two weeks to watch another episode of The Paradise on PBS. While at the motel in Boise I did a "binge watch" of House Hunters on HGTV! If I could choose, I would have HGTV, Hallmark and PBS! I guess I could choose...for a price! When you live waayyy out like we do, the options are limited and often come with A LOT you don't need or want. Rocky (our bulldog) snoring! He was out playing this morning so is taking his nap. Wednesday--Baked Potatoes, Broccoli and ??? Sunday--Leaving for road trip so restaurants for the next 5 days:) I love eating in restaurants but after 5 days will be anxious to eat some home cooking again...even if it is mine! Dog hair everywhere--need to vacuum! Nothing on a specific day. Just have my "to do" list and need to get it done before Sunday! I am working on my Swap Squares, Shabby Chic Swap Card and Design Team Project. I am hoping to get some knitting/crocheting done while on my road trip. Sometimes it's best not to plan too much because it's nice to just do nothing occasionally! Sister still recovering from hip/leg surgery. Families still needing housing--two of them! "But this I say, He which soweth sparingly shall reap also sparingly; and he which soweth bountifully shall reap also bountifully. Every man according as he purposeth in his heart, so let hime give; not grudgingly, or of necessity: for God loveth a cheerful giver. And God is able to make all grace abound toward you; that ye, always having all sufficiency in all things, may abound to every good work:"
I hope you are having a great day wherever you are--even if it's not Spring there yet! I hope your road trip goes well. Have a good week. We will make it go well! My daughter, granddaughter and I get along great and everything is fun with them:) Thanks, Deb! Have a wonderful and safe trip. Love your sign of spring, there is nothing coming up here yet. I hope the trip goes well. And the sound of the dog snoring is a comforting one. Thanks, William! Before we got Rocky I thought the snoring would be irritating like when hubby snores but it's not--very comforting indeed!! !